Picking up where the Oscar Award Winning Documentary “The Cove” left off is this simple yet profound PSA featuring all children who are standing up to tell the world that Dolphins don’t belong in tanks. It is the captivity industry which subsidizes and allows the horrific slaughter of dolphins in Japan and other parts of the world to occur. If these kids can get the point, certainly the rest of us can! January 2012. 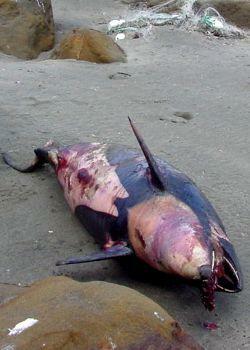 Another one of the world’s last 100 Maui’s dolphins died in fishing net in New Zealand. Its death is a another stark reminder that measures to protect the world’s most endangered marine dolphin against fisheries bycatch are inadequate to prevent their extinction. Another one of the world’s last 100 Maui’s dolphins died in a fishing net in New Zealand. “Despite overwhelming evidence that Maui’s dolphins are being killed faster than they can breed, there is a conspiracy of silence concerning these unique marine mammals”, says Thomas Tennhardt, Vice President of NABU and Chair of NABU International. Unless we can break it, Maui’s dolphins simply don’t stand a chance. Their extinction is unlikely to flatter New Zealand’s international image”. Track and survey bottlenose dolphins in Mediterranean waters to help scientists understand and combat the main threats to them and their ecosystem. If Iran closes the Strait of Hormuz, the U.S. Navy has a backup plan to save one-fifth of the world’s daily oil trade: “send in the dolphins”. 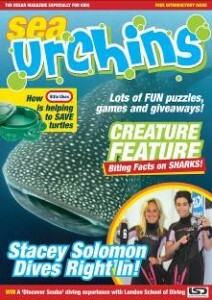 The question is: Do you support the use of dolphins and marine mammals in general for military use? Personally I don’t. 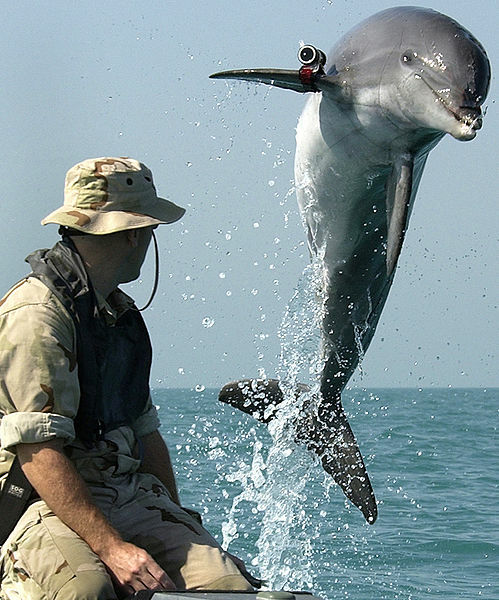 The US Navy has trained dolphins to detect mines. Now, they might be used in the conflict with Iran over its nuclear policies. According to earlier reports, the US Navy has trained about 80 dolphins to detect mines. 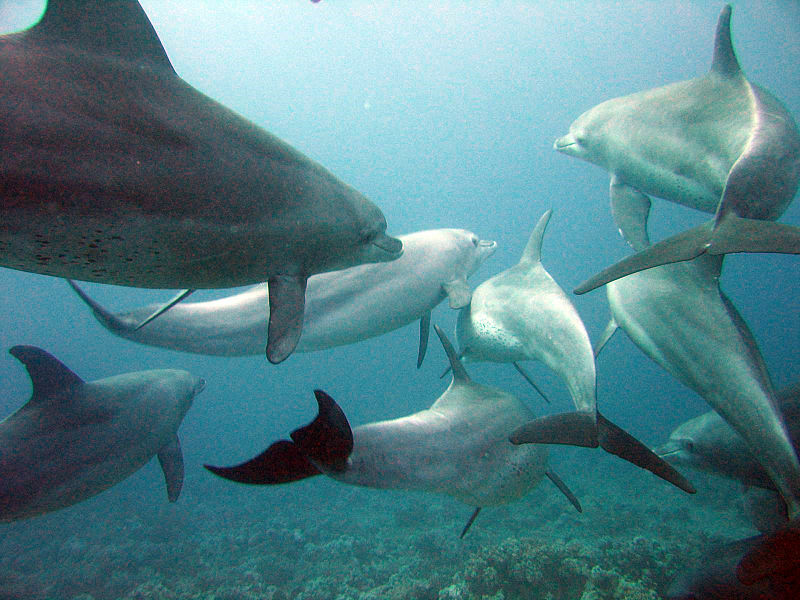 Some reports say that the dolphins only locate the mines and drop acoustic transponders nearby, so that humans can destroy the mines, but it is also possible for the dolphins to set off the mines and die in the resulting explosion, and, of course, using the dolphins in this way makes them – and any other dolphins in the area – targets for the Iranians to destroy if they can. Animals, or at least those who are conscious and capable of suffering or enjoying their lives, are not things for us to use in whatever way we find convenient. To believe that, because they are members of a different species, we can ignore or discount their interests is speciesism, a form of prejudice against beings who are not “us” that is akin to racism and sexism. We should give equal consideration to the interests of any sentient being, where their interests are similar to our own. Dolphins are social mammals, capable of enjoying their lives. They form close bonds with other members of their group. They respond to images of themselves in a mirror, and use the mirror to examine marks on parts of their body that they cannot otherwise see – a test that is widely taken to be a sign of self-awareness, which human children cannot pass until they are somewhere between 18 months and two years of age. The United States no longer conscripts its citizens to fight its wars. All its human troops are volunteers. But even conscripts have some basic rights. The dolphins have none. Late last year, People for the Ethical Treatment of Animals, together with three international orca experts, and two former orca trainers asked a federal court in San Diego to declare that five orcas held and forced to perform by SeaWorld are held as slaves in violation of the 13th Amendment to the US Constitution that outlaws slavery. 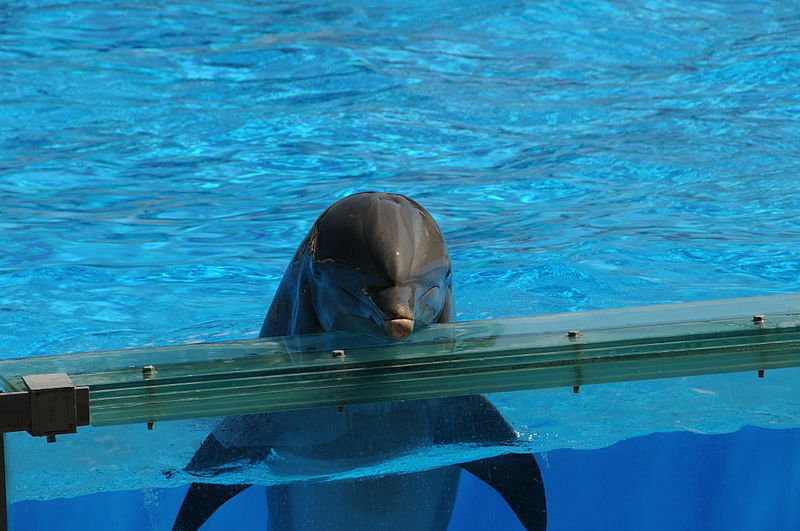 The suit has yet to be heard, but a similar case might be made against the US Navy for its use of dolphins. Various civilizations have, at times, enslaved human beings and forced them to fight for their oppressors. That despicable practice is now rightly condemned, as far as human beings are concerned, but the enslavement of other species continues, in many areas of human life, and the use of slaves in war continues in the United States Navy. It might be argued that as long as billions of animals are confined in factory farms to produce meat, eggs and milk, the use of a few dolphins in military action is trivial. Obviously, the amount of suffering we inflict on factory-farmed animals every day dwarfs whatever might happen to the dolphins. Nevertheless, just when we are starting to realize how gravely we are wronging animals, and to do something about this – like the very welcome European Union ban on standard battery cages for laying hens, which came into effect on 1 January this year – we ought not to be finding new ways to exploit them. Dolphins have nothing to do with the dispute over Iran’s nuclear plans. Whatever the rights and wrongs of taking military action against Iran, let’s leave the dolphins out of it. Have home ranges (e.g. orcas can dive as deep as 60m and travel as far as 160km in a day and bottlenose dolphins off the coast of Cornwall, UK, have been recorded to travel up to 1076km in 20 days). Are almost always in motion, even when resting and spend less than 20% of their time at the water’s surface. Orcas and Dall’s porpoise are two of the fastest animals in the sea (Dall’s porpoises can reach swimming speeds of up to 35mph). Live in highly complex societies; with some individuals holding key roles within a specific group (e.g. communicator with other pods, nursing). Choose to form strong, long-lasting social bonds with certain other members of their pod. Are intelligent and can demonstrate problem solving and abstract concept formation, e.g. utilise tools — female bottlenose dolphins in Australia have learned to use natural sponges to protect their beaks while foraging among sea urchins on the sea bed. Are altruistic, some species have been witnessed helping other members of their pod, other species and even humans in trouble. They are self-aware and display highly responsive behavior. Have culture i.e. they teach and learn traditions (e.g. Patagonian orcas partially strand themselves to catch sea-lions). Demonstrate a high degree of vocal adaptability e.g. orcas in different parts of the world have completely different dialects from one another. Are separated from their natural habitat and enclosed in a totally alien environment. Have to undergo medication and fertility control. Aquatic Mammals 2005, 31 (3) lists 199 facilities worldwide. More have established since then. Have to put up with an artificial diet, unusual noise, strange odors and the proximity of people and other unfamiliar captive animals. No longer have free will to choose social bonds. May suffer aggression from other pool mates more dominant than them. Are sometimes kept on their own (some in hotel swimming pools), e.g. four orcas are currently held in captivity on their own. The facts are plain – most dolphins and whales are not born in captivity, and with breeding rates unable to meet the need to restock facilities, dolphins and whales continue to be captured from the wild. You can help captive dolphins and the slaughter of thousands of these incredible creatures by not supporting dolphinaria.